I have to declare upfront that I do not work as a scientist. Therefore, the likelihood that I will ever need a tool watch that could withstand intense magnetic fields is close to zero. Nevertheless, I am a techno geek and a watch nerd. The thought that it is possible to combine anti-magnetic properties into a watch intrigues me immensely (Anti-magnetic watches are defined as watches that can still operate in highly magnetized environment). I got myself a Rolex Milgauss 116400GV where “GV” is glass verte or green sapphire glass. This model is under Rolex’s professional series but is the only one dedicated to scientists. The first Milgauss was introduced by Rolex back in 1954 to help scientists work in the highly magnetic charge research environment of CERN (it was postulate that it was CERN that requested Rolex to come out with the Milgauss but it has yet to be proven. For more on the earlier history of Milgauss visit: http://www.timekeeperforum.com/threads/review-of-the-rolex-milgauss-116400gv.2174/). By now you would realised the need to have such a watch. You also don’t need to know much about the inner workings of a mechanical watch to realize that a magnetic field is one of its sworn enemies. Mess with the hairspring or balance wheel by subjecting the watch to a strong magnetic field, you will end up with a watch that runs too fast or too slow. Therefore, in situations where the watch is exposed to a magnetic field, components of the watch can be magnetized and thus be disrupted. For scientist the inability to measure something to the correct time is unthinkable. Nevertheless, the Milgauss which incidentally (from the French “mille” and Gauss, thus resistant to 1000 Gauss) is immune to magnetism only to a certain limit. It is worth noting that current MRI systems start at 3000 Gauss and can go up to 50,000 Gauss, well above its capabilities. If in doubt, take off you watch. Otherwise have a de-magnetiser handy. The basic innovation in the Rolex Milgauss is the use of a Faraday cage that encloses the movement. A Faraday cage (ferromagnetic enclosure) around the movement will divert a current or magnetic field and shield and protect the entire movement, including the balance wheel and its hairspring. For complete safety, the whole movement must be enclosed in the cage. 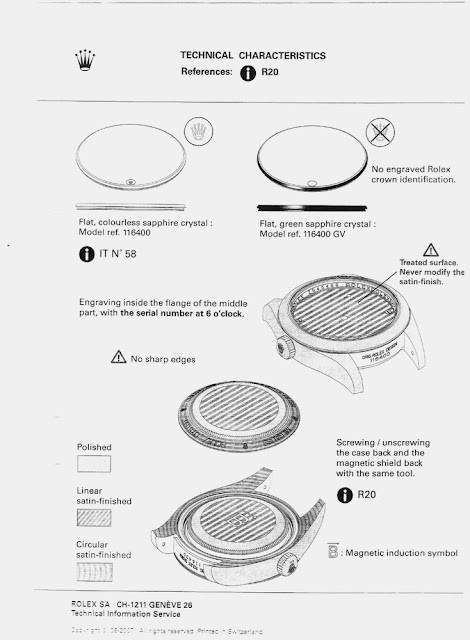 However, you need to allow a number of holes to be present, otherwise you cannot attached the watch hands or the crown that protrudes out of the cage. Unfortunately, this weakens the protection. Hence the lack of a date window for the Milgauss to reduce such weaknesses. It is also worth noting that the Milgauss GV does not sport the laser etched coronet at 6 o’clock in the crystal. A lot of reviews on the GV version tends to report erroneously about this or not at all and this could cause misinformation. Below is the technical design on this aspect for reference. The other two Milgauss models (both named “116400”, too, but without the GV nomenclature) both sport the laser etched coronet. The diagram below also shows the double case-back, one for the main case and the other for the inner Faraday case. The Milgauss GV’s dial is matte grey and have indices at 3, 6 and 9 that are orange coloured while the the other markers are white. The seconds hand is a “Lightning Bolt” design in orange. The lume of the Milgauss GV is quite special. The orange markers actually emit blue light in the dark while the white markers emit green light. There is no lume on the seconds hand. The Milgauss, like all of Rolex’s professional watches, is based on the famous oyster perpetual case. Made using polished 904L steel with a polished smooth bezel. The case is 40 mm with lug to lug length of 48 mm. Due to the Faraday cage, this watch is on the heavy side, around 157 gm. The Milgauss watches come with the Oyster Bracelet ref. 72400 which is unique to the model and not shared with other Rolex watches. The bracelet is made out of similar steel with polished center links. The closing mechanism on the ref. 72400 bracelet has a freely sprung tip with a “lever” action to open the clasp. The tip is fixed with two spring bars; one in the tip itself and one in the main clasp. Meanwhile, the bracelet size can be slightly adjusted at anytime without the need of tools using the “Easy Link” mechanism. This mechanism allows the bracelet to grow or shrink by 5mm in a blink of an eye by simply opening the clasp and pulling on one end to release the Easy Link, or folding it to hide it. Some way have an issue with the diameter of the watch but at 40 mm, I believe is a perfect size. I have a 7.5 inch wrist and it looks balanced on it. Inside the Milgauss is the in-house Rolex 3131 movement, a unique movement that can be seen as an upgrade to the Cal. 3130, sporting the in-house developed amagnetic Parachrom Blue hairspring plus an escapement which is made of an anti-magnetic alloy. The power reserve is 48 hours and the 3131 movement can also be wound manually by unscrewing the non-protected large but flat crown. This watch can be worn in a laboratory or in a formal function very easily. The size and height of the watch makes it slip under shirt cuffs easily. I like the evergreen design of the oyster perpetual case as it does not overwhelm but compliment the wearer instead. The green sapphire crystal and the “Lightning Bolt” plus the clever use of orange in the mix makes the watch feels lively.